Transform your kids' experience and development by choosing among our three levels of certification. Certify your Organization / League / Facility with Level 3 and get EVERYONE in your organization - all your Administrators, Coaches, and Parents! - on the same page with access to Pro Membership resources. 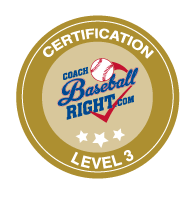 Level 3 will completely transform your baseball program! Plus, we'll provide year long follow up for support, strategies, and ideas to help your organization maximize and use their certification. Certify your Organization / League / Facility with Level 2 and get ALL your Coaches using our Pro Membership resources together. Level 2 will help your coaches teach and develop consistently throughout your program. Certify your Organization / League / Facility with Level 1, our most AFFORDABLE certification that starts your administrator with using Pro Membership resources and your coaches out on the same page very simply and consistently with using Rookie Membership resources. Plus like the other certifications, we'll provide year long follow up for support, strategies, and ideas to help utilize your certification. The perfect program for Organization and League Administrators or Lead Coaches looking to take on leadership roles! The Ultimate Coaching Experience! This weekend long program dives deep into what it takes to develop and transform baseball experiences through up-to-date and best educational practices. This is a perfect 1-on-1 coaching and mentoring program designed for Organization and League Administrators and Coaches. Maximum 20 spots for each Certification cohort. Reserve your spot today!